Write a C program to create a singly linked list of n nodes and reverse the order of nodes of the given linked list. 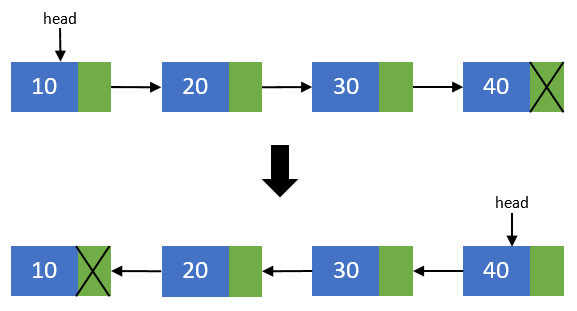 How to reverse a singly linked list in C. Algorithm and steps to reverse a singly linked list. Create two more pointers other than head namely prevNode and curNode that will hold the reference of previous node and current node respectively. Make sure that prevNode points to first node i.e. prevNode = head. head should now point to its next node i.e. the second node head = head->next. curNode should also points to the second node i.e. curNode = head. Now, disconnect the previous node i.e. the first node from others. We will make sure that it points to none. As this node is going to be our last node. Perform operation prevNode->next = NULL. Move head node to its next node i.e. head = head->next. Now, re-connect the current node to its previous node i.e. curNode->next = prevNode;. Point the previous node to current node and current node to head node. Means they should now point to prevNode = curNode; and curNode = head. Repeat steps 3-5 till head pointer becomes NULL. Now, after all nodes has been re-connected in the reverse order. Make the last node as the first node. Means the head pointer should point to prevNode pointer. Perform head = prevNode;. Finally you end up with a reversed linked list of its original.